The upholstery material on this piece of furniture has been thoroughly tested to stand up to whatever your rowdy family can throw at it. Heavy-duty materials are resistant to pilling and fiber loss letting you get the most use as possible out of your sofa or chair. 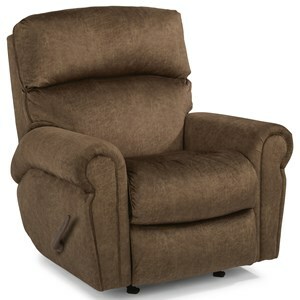 If you're looking for a simple yet comfortable addition for your living room or family room, this is the perfect recliner for you. 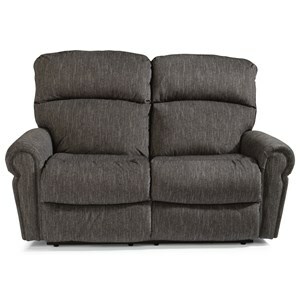 Featuring divided back cushions, a fully padded footrest and plush rolled arms providing all over comfort while you relax. Subtle classic details such as welt cording adds a tasteful touch of traditional style on this simple piece. This recliner requires 5" of wall clearance. 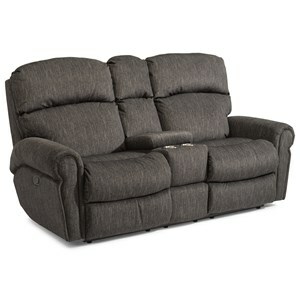 The Langston Casual Recliner by Flexsteel at Powell's Furniture and Mattress in the Fredericksburg, Richmond, Charlottesville, Virginia and Maryland area. Product availability may vary. Contact us for the most current availability on this product. Fabric Options Choose from a selection of over 1,000 fabrics. Special order charges may apply. Padding & Ergonomics Standard is the high density cushion uses a 2 lb high-resiliency, high-density polyurethane foam core topped with 1.2 lb recovery foam and bonded polyester fibers. Warranty A limited lifetime warranty applies to all seat spring systems, frames, and most cushion constructions. 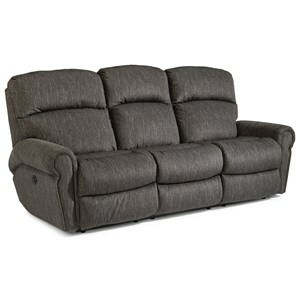 A five year warranty covers all sofa sleeper systems and power motors. The Luxury Cushion is covered by a limited two-year warranty. Upholstery fabrics and leathers are warranted against manufacturer defect for one year. Relax in casual comfort with the Langston collection. Each piece in this collection features divided back cushions and a fully padded footrest providing support from head to toe. Rolled arms with welt cording instill a touch of traditional style onto these casual pieces. Available in non-power and power reclining mechanisms as well as USB and power headrest options, you won't have any trouble finding the perfect set for your home and lifestyle. The Langston collection is a great option if you are looking for Casual furniture in the Fredericksburg, Richmond, Charlottesville, Virginia and Maryland area. Browse other items in the Langston collection from Powell's Furniture and Mattress in the Fredericksburg, Richmond, Charlottesville, Virginia and Maryland area.